Multidimensional scaling (MDS) is a technique that visualizes dissimilarities between pairs of objects as distances between points in a low dimensional space. In symbolic MDS, a dissimilarity is not just a value but can represent an interval or even a histogram. 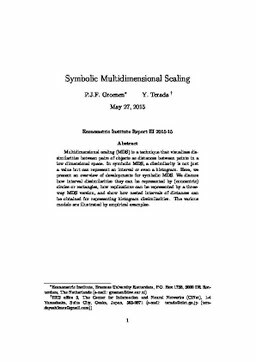 Here, we present an overview of developments for symbolic MDS. We discuss how interval dissimilarities they can be represented by (concentric) circles or rectangles, how replications can be represented by a three-way MDS version, and show how nested intervals of distances can be obtained for representing histogram dissimilarities. The various models are illustrated by empirical examples.